Originally, Bagatelle was nothing more than a modest hunting lodge, bought by the Maréchal d'Estrées (1) in 1720  a spot for occasional festivities and hunting meets. In 1770, the Comte Chimay  chief huntsman for the Comte d'Artois (2), brother of Louis XVI  acquired the property. Invited there by Chimay, the Comte d'Artois developed quite a passion for the estate and purchased it from Chimay in 1775. In 1777, he demolished the by-then decaying structure and  as a folly, following a wager with his close friend and sister-in-law, the Queen Marie-Antoinette  built in its place a grander and quite extraordinary castle, designed by the architect François-Joseph Belanger (3). The extravagant project, estimated to cost over two million livres, was constructed in a record time of only 63 days! A beautifully landscaped park surrounded the fabulous estate. Miraculously spared during the Revolution, Bagatelle was to experience several fates: as a restaurant in 1797, then as a hunting lodge again under Napoléon. The estate was finally returned to the family of the Comte d'Artois during the period of the Restoration. Purchased by Lord Seymour (4) in 1835, Bagatelle was reborn once again. With the addition of a grand entrance on the park side, an orangerie and new stables, the park was extended and then transformed into the Jardin Napoléon III during the second half of the 19th century. Sir Richard Wallace (5), the adopted son of Lord Seymour, arranged for the building of the Trianon, as well as two sentry pavillions and the two terraces which still exist today. In 1905, Bagatelle was acquired by the City of Paris. Just prior to its redevelopment, Bagatelle was a strange sight. A landscape where rivers, paths and beds of flowers  created in the 19th century  softened the surprise effects of the pre-romantic gardens of the Comte d'Artois, without detracting from its spirit. Starting in 1905, Jean-Claude Nicolas Forestier (6), the Commissioner of Gardens for Paris, set about redeveloping the gardens, while succeeding in retaining their style. In order to make the public more aware of the growing popularity of horticulture, Forestier created temporary and permanent collections of horticultural plants. He built the famous rose gardens (over 9,000 plants today), the iris garden and the presenters, and designed a pond to improve the presentation of aquatic plants and the water lilies which were so cherished by the painter Claude Monet. In 1907 he organized the first international competition for new roses, a practice which continues to this day  occurring each year in June. Exhibitions, concerts and various cultural events are periodically held in the castle and the magnificent Bagatelle gardens, which span 59 acres (24 hectares) in the Bois de Boulogne. The annual Festival de Chopin à Paris, founded in 1983, takes place each June and July at the Orangerie de Bagatelle. Access: Allée de Longchamp, Route de Sèvres à Neuilly, Bois de Boulogne, 75016 Paris. Métro: Porte Maillot -or- Pont de Neuilly (line 1), Porte Dauphine (line 2), Neuilly Porte Maillot -or- Avenue Foch (RER C). Bus: line 43 from Pont de Neuilly, or line 244 from Porte Maillot. Phone: 01.40.67.97.00; Groups - 01.40.71.75.23. Admission price to castle: unknown. Admission to gardens: 1€. Castle hours: Individual visitors  Saturday, Sunday and bank holidays; guided tour at 3 p.m. and 4.30 p.m. (reserve 2 months in advance). Garden hours: Open 8:00 a.m. weekdays, 9:00 a.m. weekends; close 7:00 p.m. Sept. 1 - April 30, 8:00 p.m. May 1 - August 31. Collections in the castle: Decorative arts, history, furniture, painting, sculpture, textiles. Practical Information: Visits in foreign languages, group, guided tours, conferences, wheelchair hire, book shop, gift shop, restaurant, photography allowed, car & bus parking. 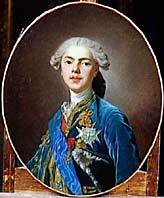 (1) Louis-César Le Tellier de Louvois d'Estrées (b1695, d1771)  The 39th baron of Montmirail, 4th son of Michel François Le Tellier. 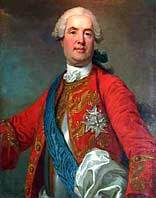 As Marshal of France in 1757, served as Commander in Chief of the armies in Wesphalia. (2) Philippe de France, Comte d'Artois (b1757, d1836)  Born at the Palace of Versailles, the grandson of Louis XV and his Polish queen, Marie Leszczynska, and son of Louis (the uncrowned dauphin) and his German wife, Maria-Josefa of Saxe. As a young prince he was a noted womanizer, popular, well-mannered and entertaining. He was crowned Charles X, King of France, in 1824 in the cathedral at Reims and reigned until the French Revolution of 1830  when he abdicated rather than become a constitutional monarch. He was the last king of the Bourbon line to reign over France. 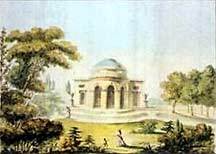 (3) François-Joseph Belanger (b1744, d1818)  An architect and landscape designer, Belanger was influential in the development of the Louis XVI style. 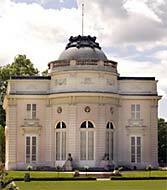 His most important commission was the construction and decoration of the Château de Bagatelle in the Bois de Boulogne. (4) Edward Adolphus Seymour (b1805, d1885)  Seymour, the 12th Duke of Somerset, was a British Whig aristocrat and politician, who served in various cabinet positions in England during the mid-19th century. (5) Sir Richard Wallace (b1818, d1890)  An English art collector, the illegitimate son of Richard Seymour, he inherited his father's extensive collection of European art in 1871. Wallace was created baronet in 1871 and was a Member of British Parliament from 1873 to 1885. In Paris, he is perhaps best known for his donation of 50 sculptured water fountains to the city. On his passing in 1890, he was interred in Le Père Lachaise Cemetery in Paris. (6) Jean-Claude Nicolas Forestier (b1861, d1930)  Trained with Jean-Charles Adolphe Alphand (b 1817, d1891; engineer for Napoléon III), Forestier became conservator of the promenades of Paris. He developed an arboretum at Vincennes and the gardens of the Champ-de-Mars below the Eiffel Tower. In 1925, he became Inspector of Gardens for the International Exhibition of Decorative Arts and undertook projects in South America, including a plan for the improvement of Buenos Aires. In Spain he designed the Maria-Luisa Park in Seville. See also: Plan générale du jardin de Bagatelle... (General plan of the Bagatelle Garden) by Jean Charles Krafft (70k JPG image), © Donald A. Heald Rare Books, Prints & Maps  136 East 74th Street, New York, NY 10021, tel. 1-212-744-3505. Sources: Parc de Bagatelle, hosted on The City of Paris Official Site. Wikipedia, the Free Encyclopedia. CityVox. The Frick Collection  Decorative Arts. The French Ministry of Culture Joconde database. Recommended reading: Great City Parks (July 1, 2001  Spon Press, an imprint of the Taylor & Francis Group), by Alan Tate, Associate Professor and Head of the Department of Landscape Architecture at the University of Manitoba at Winnipeg. Hanging Out in Europe (September 1, 2001  Frommers), by Kristen Couse. The French Garden (Vendôme Press), by Mic Chamblas-Ploton, Jean-Pierre Babelon, Jean-Baptiste Leroux (Photographer). Images: M. le Maréchal d'Estrées, by Louis-Michel van Loo, from Châteaux et Jardins d'Ambleville. Philippe de France, Comte d'Artois, by Louis-Michel van Loo, property of the Château de Versailles, © Arnaudet  Réunion des musées nationaux, 10 rue de l'Abbaye, 75006 Paris. Bagatelle Pavillion, by François Belanger, from Art.com. Château de Bagatelle, © Jocelen Janon, from Rosa Rosam.